The 31 August issue of ‘the Motor Cycle’ carried a 12 page article on the ISDT that never was. 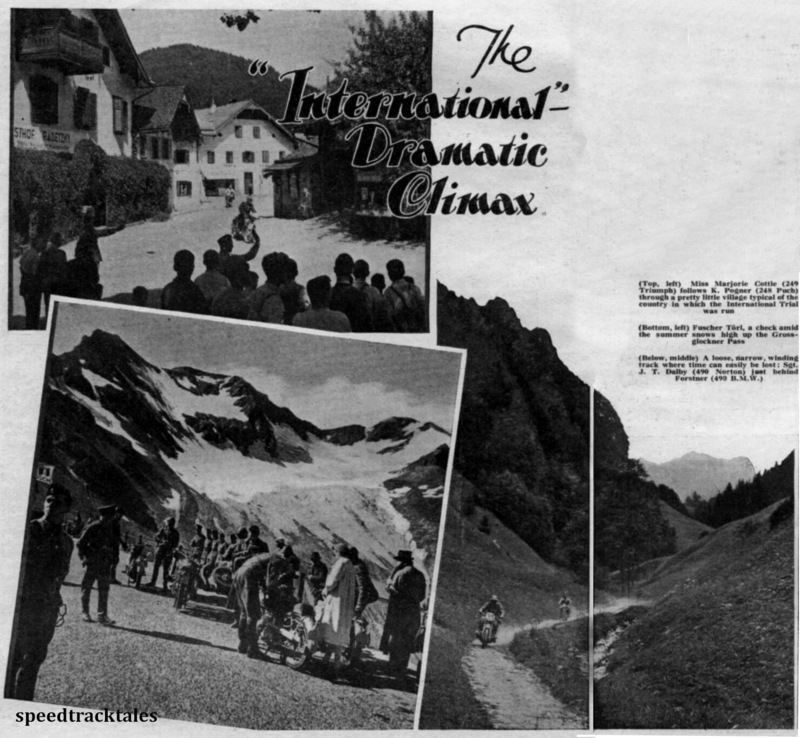 Possibly heralded as being the best ISDT of all time, on paper the potential obsessive stage management by the German Nazi regime looking to impress foreign powers of its greatness could well have put on the best event ever. The grant finale of the event rather than a speed test was to be a scramble and surviving vide owe have seen shows it to be a quite remarkable event in its severity of technicl difficulty for the tie. However from arrival at the venue the event was beset with problems, firstly to all it appeared the Germans had been expecting the event not to happen at all, so preparations had been rushed and not complete. Despite a lot of man power being committed there were at times fuel shortages and the German officials tried modifying the traditional rules as the event progressed. The going on the other hand was not far off the most extreme the riders had ever seen, not just because of the Alpine setting in North Austria but also the extensive use of unmade tracks across pine forests that had in cases been cleared just for the event. The event withered for many competitors to a dead stop before the final day after Germany declared a pact with Russia that resulted in the division of Poland and was going to lead to the beginning of the second world war. Even though the Germans finished the six days it was a result devoid of competition and so after the end of the war the FIM annulled the results so the Trophies were never awarded. The greatest of all International Six Days Trials, that held in Germany last week, was virtually brought to an end last Friday. The cause, needless to state, was the European situation. In Salzburg information as to what was really happening was scrappy in the extreme. The German papers revealed little; those British papers available were two days old; wireless reception of the English news bulletins was next to hopeless. In the 7th September 1939 issue of the Motor Cycle, the editor of the magazine A. B. Bourne who had been in Germany covering the ISDT 1939 event published an article titles ‘My Week in Germany’ giving his impressions of the events that occurred shaping the history of this notorious sporting occaision. To review the International Six Days after all that was written in last Thursday’s issue would be superfluous. Everyone knows what happened and how on Friday, the fifth day, the British contingent withdrew from the trial, left Salzburg and hurried to the Swiss frontier and home. It is probably difficult for anyone not among the party to realise how cut off the British contingent was from knowledge of what was going on between the capitals of Europe. All at Salzburg sensed that there was a crisis, but how grave it was none knew. As we said in our description of the trial, the German papers revealed little, those British papers available were two days old, and wireless reception of the English news bulletins was next to hopeless. Of course, there were many who started in the trial with little idea of what a modern International means. Somehow or other the impression that these trials are merely high-speed tours in glorious country still seems to exist. The facts are, as we have tried to convey in describing the event, that the modern trial as held in Germany is an Alpine Grand Prix with sections just about as bad as any included in British sporting trials. Bikewriter.com: Post-Academy Awards Special Backmarker: The Colonel’s Motorcycles. Many readers of this blog contact me with their thanks for providing what is the non existent ISDT reading room in the National Motorcycle Museum or even the Auto Cycle Union Six Days Archives. Such praise is often only due to the work and help of many readers who are ex riders or the family of ex riders who are willing to share, at no charge, their family material so as to help others who may not be so lucky to be able to recall past exploits of favourite relatives so easily to supplement my otherwise meagre budget to purchase important relics which may appear on eBay from time to time..
No more so are these gifts welcome than a recent contact from Susan Coates now based in the USA but from a British Motorcycling family who she found a collection of old magazines on a recent visit. Amongst this collection was an original copy of the 30th August 1939 edition of ‘Motor Cycling‘ with a full report of the ISDT 1939 which she rapidly sent me a scanned copy to be able to share with others through the site. Let us hope that peace will prevail and that the 1940 event will take place under happier auspices. WHATEVER the future may hold in store for the International Six Days’ Trial, the 21st event of the series will go down in history – so far as Great Britain is concerned – as the trial which never finished. In the early hours of Friday morning it was decided to withdraw the entire British entry, and it is fitting, therefore, that the facts underlying that decision should be recorded before they become distorted with the passage of time. 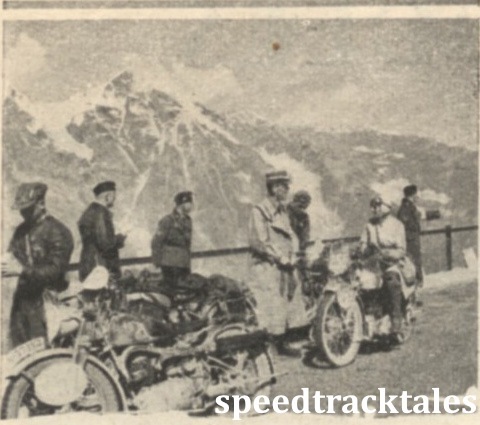 Image left – A wonderful view of the Grossglockner Pass .The leading rider is L/Cpl A.C. Doyle BSA of the War Office ‘A’ Team, centre – This picture gives a good idea of the interest villagers took in the trial, the rider is again L/Cpl A.C. Doyle (348cc BSA), right – A group of NSKK officials operating a time check at the top of the Grossglockner Pass during Wednesday’s run . The riders are #165 E Eisenmann (346 NSU) and #166 Colin Edge (347 Matchless) who, despite carrying on against doctors orders, did not lose a single point up to the time he withdrew with the other British Riders. 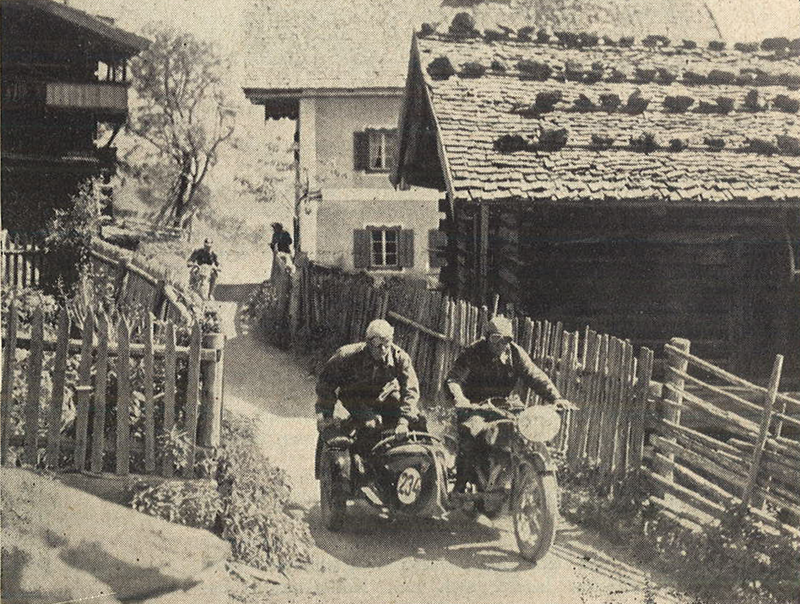 This post is a serialisation of an article that originally appeared over 75 years ago in ‘Das Motorrad’, the popular Motorcycling magazine in the German Language as it covered the proceedings of the 1939 ISDT, an event to finish in controversy and the results eventually annulled by the FIM. The Bavarian Forest leg lead far into the Bavarian Forest, to the noon time check at Viechtach. There were no special terrain difficulties, but the ordinary bad minor roads of the Bavarian Forest. Only a short 15 kilometre distance before the time check at noon had been full of terrain difficulties. The approach to the Bavarian Forest did pass through the hometown of the Führer, Braunau am Inn, where also a time check had been erected. In the morning, a number of the English participants didn’t show up at the start, as they had been advised by their team leader to go back home. Some of them didn’t follow this procedure, and did start despite all rumors. Amongst those with good nerves, of course, our old friend “Miss Kottelet” had been; also Lieutenant Colonel Bennett, team leader of the English army teams, did let his Army teams start.